Hawaii Island hopping allows you to see all that is Hawaii in one easy vacation. You unpack once, someone else takes care of the ‘driving’ and you are on your way to explore all that Hawaii has to offer. Island hopping on a cruise versus flying to each island allows you a taste of each of the four major islands without the hassle. Here are the top 10 things to see when Hawaii Island hopping. 1. 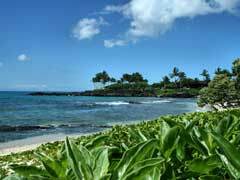 Things to do on the Big Island of Hawaii include of course, the beaches but also many snorkeling opportunities, some with manta rays and dolphins. 2. Hawaii is home to Pearl Harbor a historical and moving tribute to the men who lost their lives in December of 1941. 3.	things to do in Maui, the Magic Isle include the town of Lahaina, Kaanapali beach and many golf courses. 4. Ocean Kayak in Maui while Hawaii Island hopping, amid dolphins and coral reefs and green turtles. Get out and snorkel in the crystal clear waters and admire the city and coastline from the water. 5. Atlantis Submarine tours, go 125 feet below the surface in Maui allows you to discover the delights of the ocean up close and without getting wet. 6. Oahu, the Heart of Hawaii offers open cockpit aircraft tours, allowing you to see the island from high above in powered hang gliders. 7. Another thing to do in Oahu is Diamond Head, a large crater that offers amazing panoramic views and easy hiking opportunities. 8.	things to do in Kauai, the Garden Island include helicopter tours that allow you to see more of the island than any other way. 9. The gorgeous Napali coast of Kauai has extraordinary landscapes including sea caves, rock formations, and waterfalls and of course, pristine beaches and plenty of green sea turtles to interact with. 10. Hawaii Island hopping also allows you plenty of time to learn to surf from qualified instructors on various islands. Hang Ten! Hawaii Island hopping lets you enjoy all of the diversity all from the different islands all on one memorable trip. Make your Hawaii cruise vacation a trip of a lifetime when you choose not one, or two, but 4 of the wonderful islands of Hawaii.